The North Shore of Massachusetts is home to a variety of Greek-American communities. Every summer, many host festivals, serving plenty of traditional Greek meals. 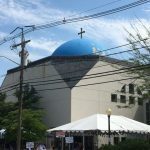 I recently went to the Greek food festival in the little seaside city of Newburyport. 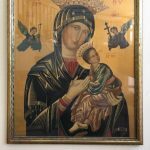 It took place in the city’s Annunciation Greek Orthodox Church. I had the chance to try some of the event’s appetizing foods and learn more about the festival. The foods were primarily served in the church’s Nicholson Hall. It was entirely decorated with Greek flags, blue table mats, and blue and white hydrangeas. Plus, Greek music was playing in the background which got me into the spirit. It seemed as if I were in some town in Greece and not Newburyport. As for the foods, I had many to choose from: moussaka, braised lamb shanks, spanakopita, pastichio, souvlaki, etc. 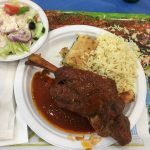 I decided to order one of the lamb shanks, the festival’s most popular dish and I understood why because it was smothered in an exquisite tomato sauce with flavors of cinnamon and oregano. Also, The meat had a tender texture, which made it easy to cut off from the bone. 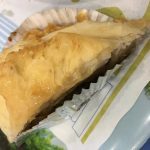 It came with tasty rice pilaf, Greek salad, and spanakopita, a phyllo dough pie layered with warm, salty feta cheese and spinach. To drink, I had some ice cold Mythos beer, which was refreshing and came in good handy on a hot day. For dessert, I had baklava. It was especially made by my grandma’s friend, Mary, who goes to the church. I would have to say it was the best baklava I ever tasted. The pastry was soaked in sweet honey and filled with chopped walnuts. I could tell it was just made fresh out of the oven due to its soft texture, which is how I like it. The festival had other amenities as well. Outside Nicholson Hall were the festival’s volunteers grilling meat for gyros. I was too full from my meal but I bet the gyros were delightful. I could smell the meat’s pleasant aroma coming from the grill. 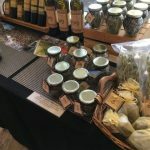 There was also a vendor selling and offering samples of various flavored Greek olive oils. I tried their lemon olive oil, which was sour, of course, but savory. I had the chance to meet the church’s priest, Father Costin Popescu. He was nice and friendly and provided me interesting information about the festival and the church. Apparently, it takes two months for the volunteers to cook the foods for the festivals. I was surprised but it must take them a lot of hard work and effort to make all those delicious meals! Father Popescu also informed me that the church is currently celebrating its 100th anniversary and having a live band with Greek dancing. Unfortunately, I was not able to see the band and the dancing but I am sure it was fun. Overall, it was a pleasure visiting Newburyport’s Greek Food Festival. The food was spectacular and I enjoyed learning about what goes on at the festival and the history of the church. I hope that it will continue to host many fun festivals in the future and I will definitely return next summer! For more information about the event, click here.